If you are looking for an honestly priced, accurate and American-made big revolver, the new Super Redhawk is well worth investigating. When Bill Ruger designed and built a new gun, he clearly had the shooter in mind. 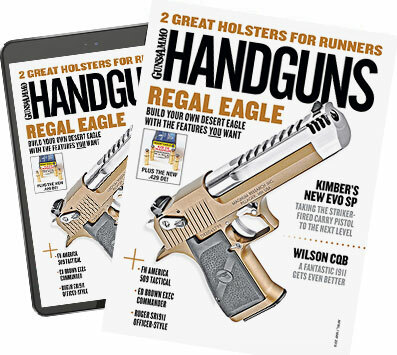 The Redhawk and Super Redhawk double-action revolvers, for example, are powerful, strong wheelguns—with the latter carrying the design to its logical conclusion for outdoor enthusiasts and those who simply like big double-action handguns. 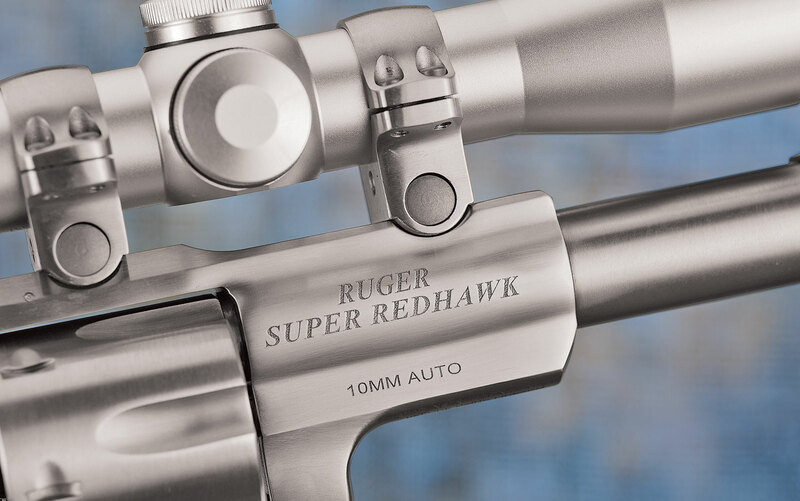 The Super Redhawk features an extended frame, heavy barrel and rubber overmolded grips to help tame the recoil of magnum calibers, and those same traits are right at home for the newest version, which is chambered in 10mm Auto. While other Super Redhawks are chambered for big-boomer revolver rounds, the newest is chambered in 10mm Auto. Moon clips allow this rebated-rim cartridge to work in a wheelgun. The 10mm is on a rebound after years of so-so existence, and it’s very handy in a revolver when combined with a full-moon clip. It should appeal to those looking for something a little softer than chamberings such as .44 Remington Magnum, .454 Casull and .480 Ruger. The gun checks in at 54 ounces. Adding a scope and the included Ruger rings brought it up to around 64 ounces unloaded. The gun is made from stainless steel, satin polished with all the flats and rounded edges where they are supposed to be. 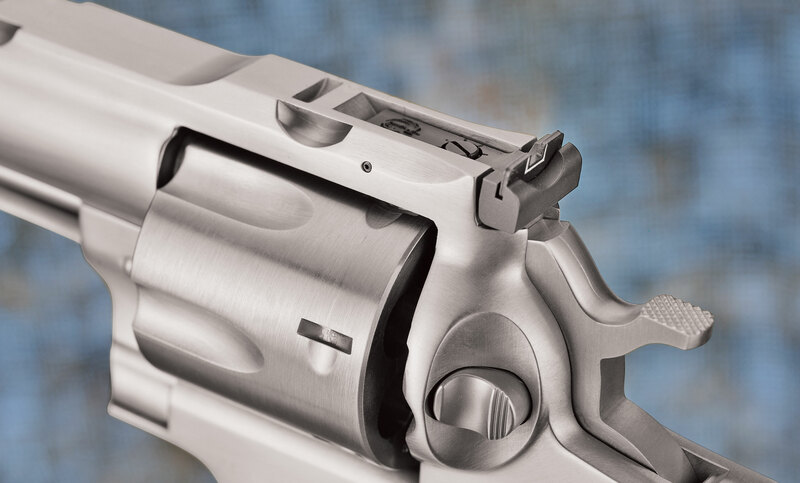 There are no prominent brush marks from polishing, even around hard-to-reach areas on the trigger guard, crane and the rear of the frame and the cylinder release. The Super Redhawk is a strong revolver, and its frame extends about a third of the way along the 6.5-inch barrel on the 10mm version. I compared this new model to my own 1990 production gun in .44 Magnum, which sports a 9.5-inch barrel. The 6.5-inch barrel on the 10mm balances a lot better in the hand when the gun is loaded, even though the 10mm has a barrel diameter slightly larger than my .44’s. Additionally, while both grip packages look the same, the girth on the new gun is fuller, adding to cushioning of the more full-house loads. Interestingly, the front and rear sights remain the same—save reinforcing on the front sight with machine screws. Sights feature a red insert on the front blade with a white outline on the rear, which is fully adjustable. This is a big gun, with the frame surrounding the barrel about a third of the way out. While on other guns the main frame stops just millimeters forward of the forcing cone, on the Super it extends outward just past the ejection rod. It’s worth noting this is an excellent setup for custom gunsmiths to add or to modify barrels of varying lengths. Measuring the cylinder diameter between my 1990 model and the new version, the new one is about 0.042 inch bigger and 0.027 inch longer than the old one. The locking bolt notches are off-center from the charge holes, adding more strength for those who like to shoot heavy factory loads or prefer their handloads on the warm side. The cylinder features off-center lug notches that don’t take away metal from the charge holes, which adds strength. The gun has cuts in the topstrap that mate up with the supplied scope rings. If I have one criticism it is with the trigger pull. 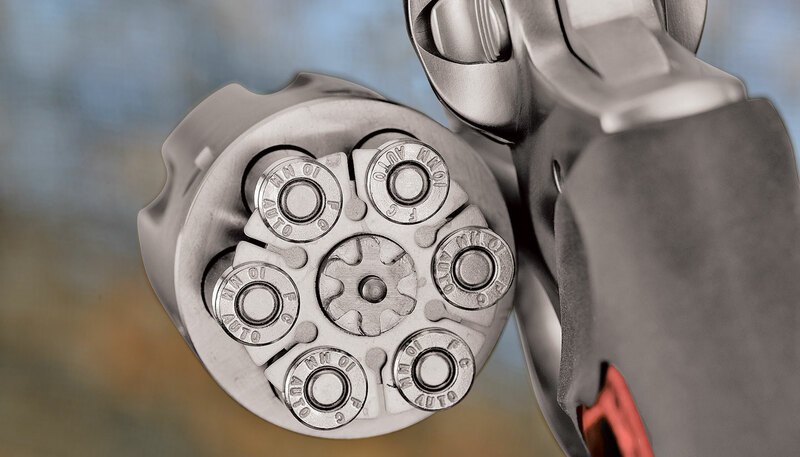 The single-action pull breaks at about five pounds, and the double-action pull is twice that—a handful to operate despite the smooth face on the trigger itself. Additional features include the time-tested Ruger transfer-bar mechanism for safety, frame-mounted firing pin, ease of disassembly without special tools, and ergonomic laminated grips with an overmold for recoil reduction. The gun ships with three full-moon clips, a plastic case and gun lock. Since the gun also came supplied with stainless steel rings that fit into machined cuts in the top rib, I decided to test the gun with an old Bausch & Lomb 2X scope. This added heft made the 10mm even more pleasant to shoot. The addition of a scope did not cramp the space between the checkered hammer spur and the eyepiece too much, but I would not go with a scope with an eyepiece larger than 1.5 inches in diameter. At the onset, groups were erratic, but after a slight break-in period, groups improved dramatically—proving that no matter the gun or company, fresh barrels often need some tuning (read burnishing) before you get to any serious ammo-testing session. In the end, I was pleased with the gun, and in the course of my shooting, a five-shot group emerged with the Winchester brand that went into a tight 1.125-inch circle. A few years back I tested the 10mm Auto in a Dan Wesson with a five-inch barrel. Comparing velocities out of the two different barrel lengths, velocity of the Norma round increased 38 fps in the Super Redhawk while the Ruger pushed Remingtons out of the gun 65 fps faster than the Dan Wesson. 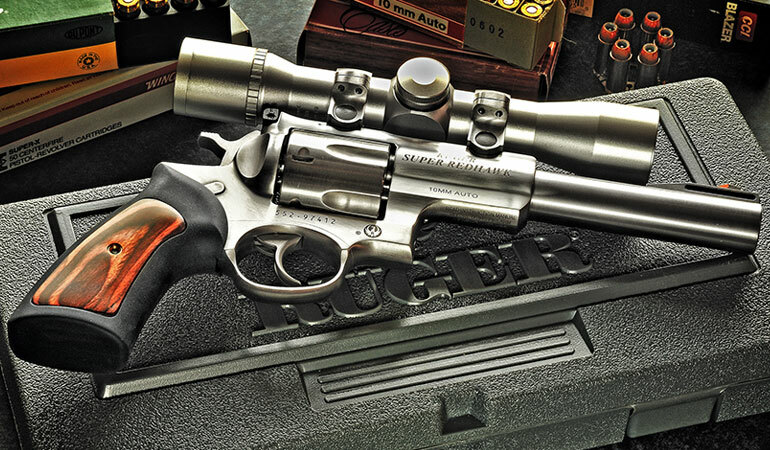 If you are looking for an honestly priced, accurate and American-made big revolver and don’t mind dealing with moon clips, the new Super Redhawk is well worth investigating.